Fore/aft balance and control makes for great fluid skiing, in dynamic balance and adaptable to all conditions, with instant line and turn shape control and more. Lesser skilled skiers tend to hunch over at the hips, along the length of the skis, as above, but forward really is the relationship between the hips and boots, in time and space. Fore/aft movement has an ankle component, referred to as opening/closing the ankle or Dorsiflexion and plantarflexion - but it generally is seen as a complex movement (involving ankles, knees, hips, arms) of the body 1, to move the body forward or back, as the need may be, to maintain fore/aft balance. 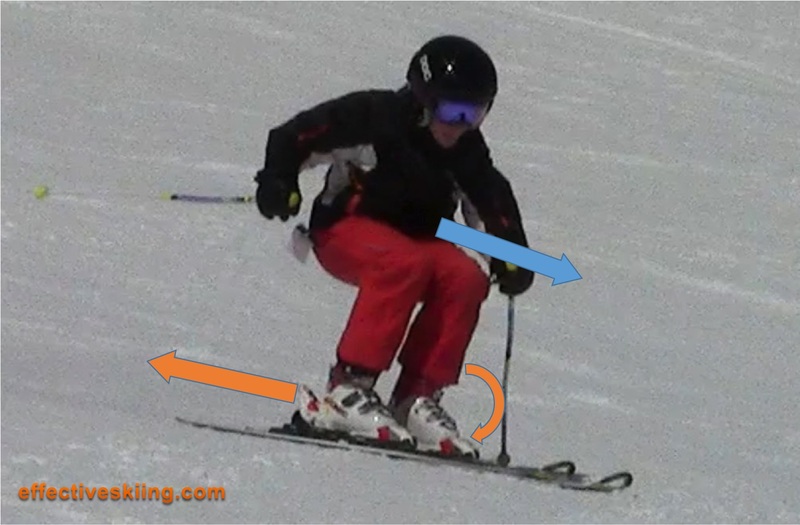 Fore/aft movement can also be seen instead as moving the boots forward or back 2, with the same ankle action complemented by knees and hamstrings - this perspective is suitable for performance skiing3 - and only complemented by some upper body movements if required. Although generally seen as a movement along the skis, recentering is really a movement across the skis as well: as a skier moves towards performance skiing, the skis turn more and more across the hill, while the body travels more forward down the hill. See recentering and Forward is down. So, in general, we can say that in different phases of the turn, we need to be in a different place on the skis. Forward at the top, on the sweet spot at the fall line and letting them run at the end. While we could park and ride, say "park" the body on top of the middle of the ski and ride that "position" through the turn, it is more effective to use the parts of the ski as they were intended. This fore/aft movement is more pronounced, the more performance we need from the ski. From cruising on easy groomers on top of the middle of the ski, to very fast GS turns on ice. We generally try to avoid "disturbing" the upper body - we avoid hunching excessively at the hips (which conversely moves the hips back). Although sometimes bigger adjustments are required, we generally adjust fore/aft balance just by moving the feet forward and back and this works best when the skis are unweighted. Trying to push the hips forward also generates an often unwanted weighting of the skis (the only lever we have to actually move the hips being pushing into the skis). At the bottom of the turn, if we're forward, the skis will bend more and decelerate - great for speed control. 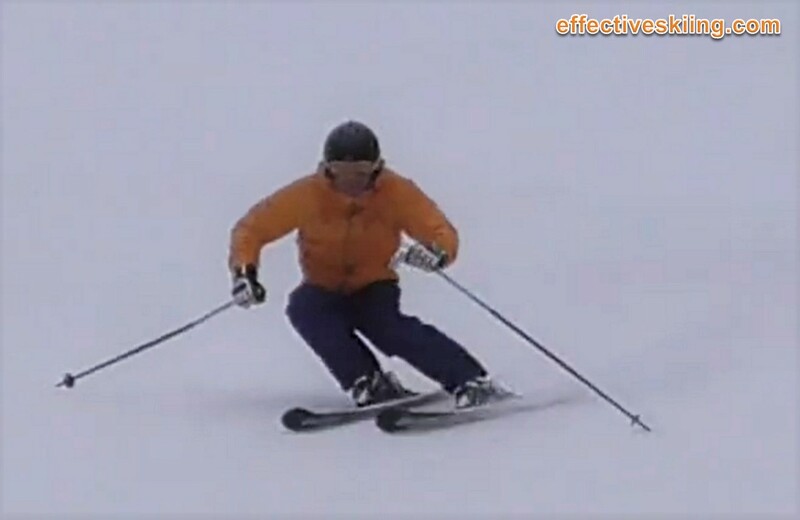 If we finish more centered or even aft, the skis tend to accelerate, as they cross under the body. Never get back on the skis. When you feel pressure on the heels, you're on the edge. By the time you feel the back of the boot, it is a little late. If you feel the tail of the skis, it is definitely too late! Not even in powder. If you want to ski more centered in powder to let the tips rise, fine, but don't think "ski the tails". Falls backwards or attempts to recover from such are bad news for the knees. We generally need to bend the tips of the skis and make sure they start the groove in the snow that the rest of the ski will follow while carving. When the tips are bending, they also provide a shorter turn and speed control. Using the Sweet spot of the ski when pressure is high, is important for great ski performance. 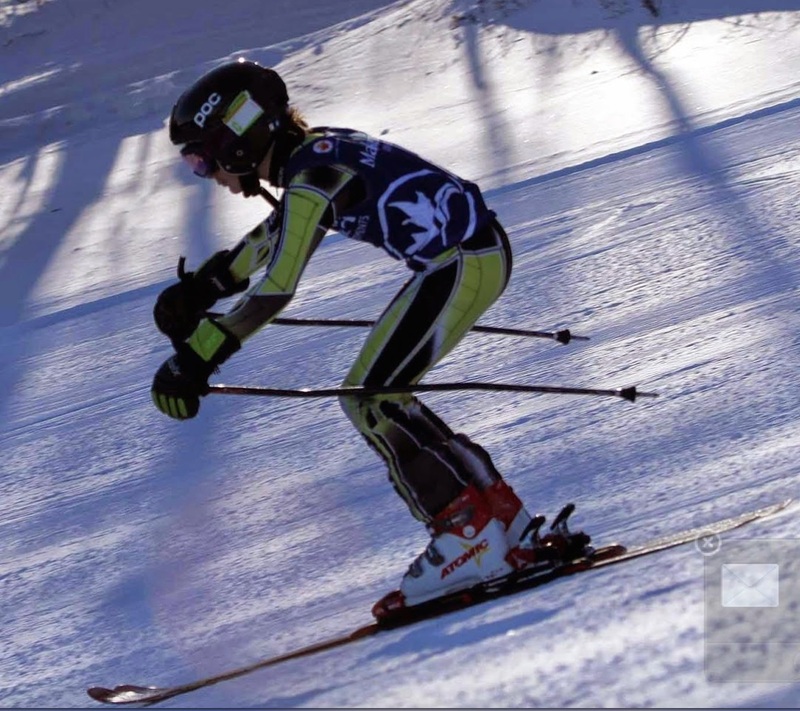 Often, at the end of the turn, in performance skiing, the skiers are slightly back temporarily (without being on the tails of the skis), while in ski racing, sometimes even the tails of the skis have a part to play. Modern recreational super-shaped skis do not require a lot of tip bending so, between being on the tails of the skis and being on the tips, there is a sweetspot, where recreational and expert skiers alike can spend most of the time during lazy runs or come back to during faster runs. As the skiing gets more dynamic, on steeper slopes and higher speeds, the effort for recentering becomes higher as well. Member-only content avilable (74 words). See Skiing - a philosophy of movement for a detailed comparison of the different movement frameworks. Viewed 3412 times ( | Print ) this page.